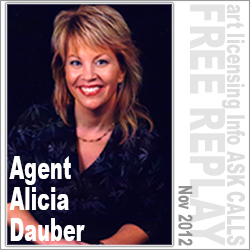 Alicia Dauber is the owner and active principal of Licensing Liaison, a full-service art licensing agency, based in the picturesque Pacific Northwest. Prior to launching the agency, she spent 18 years with Bergsma Gallery Press in various positions including Licensing Director and National Sales Manager. Alicia addresses many of the questions facing artists in regard to working with an agent, including collection development, artist/agent relationships, need for computer skills, annual calendars for showing art and the quantity of art needed for a good licensing foundation.